I’m a bit behind here as the album’s been out since February and has already copped a number of glowing reviews. And this is another one. 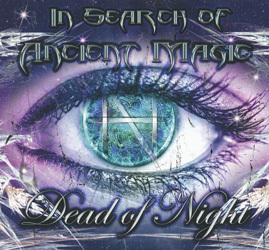 At its core, Dead of Night’s ‘In Search Of Ancient Magic’ is a testament to the talent and tenacity of a great young British band. Spontaneous and effervescent, the symphonic metal quartet’s third release shows them continuing to expand their horizons and broaden both in scope and vision. ‘…Ancient Magic’ is an accessible and amiable offering with light and shade aplenty, with heavier cuts light ‘Child Of Wolves’ happily rubbing shoulders with wannabe hit single ‘I Will Go Down To the Sea’; ‘Hiraeth’ is a beautiful ballad which gives vocalist Briony Featon a showcase for her incredible voice, and ‘The Old Straight Track’ is a hard-nosed rocker, delivered with panache. Formed in 2013 by virtuoso Carl Eden, Dead Of Night opened their account a year later with ‘The Dead Shall Rise’, pretty much a solo project with Eden doing everything but the vocals which he left to Courtney Cecere; his programmed guitar parts were then replaced by some stunning work courtesy of Hadian Gates. A great start, to be sure, but nothing ever goes to plan and by 2016 Dead Of Night featured Featon behind the mic stand and Dave Gudgeon on drums, and the new-look outfit re-imagined the first album under the name ‘The Dead Shall Rise Again.’ A couple more tweaks in line-up bring us to ‘…Ancient Magic’; a full band line-up sees Featon and Eden (now covering both keyboards and drums) joined by guitarist Dan Roberts and bassist Jason Peacock, and, between them, the delivery of an album of great splendour. Shades of Karnataka spring to mind on the one hand, although ‘The Might Of The Deep’ would easily sit comfortably on a Nightwish album, and ‘Michael Faraday’ is a pure slice of Europop. Versatile as they are talented, this is a band of many facets.